For other people named Miguel Cabrera, see Miguel Cabrera (disambiguation). This name uses Spanish naming customs: the first or paternal family name is Cabrera and the second or maternal family name is Torres. 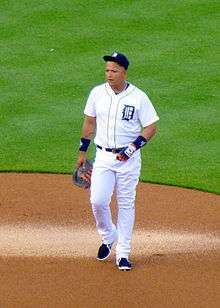 José Miguel Cabrera Torres (born April 18, 1983), commonly known as Miguel Cabrera and nicknamed "Miggy", is a Venezuelan professional baseball first baseman who plays for the Detroit Tigers of Major League Baseball (MLB). Since his debut in 2003 he is a two-time American League (AL) Most Valuable Player (MVP) award winner, a four-time AL batting champion, and an eleven-time MLB All-Star. He has played at first and third base for most of his major league career, but primarily played left and right field before 2006. He claimed the 17th Major League Baseball Triple Crown in 2012, the first to do so in 45 seasons. Cabrera was signed in 1999 as an amateur free agent by the Florida Marlins, and progressed through their minor league system. He made his Major League debut in mid-2003 at the age of 20, and contributed to the Marlins' World Series success later that year. 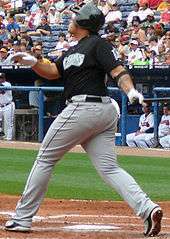 Cabrera was a regular player for the Marlins over the next four seasons before being traded to the Detroit Tigers in late 2007. In 2012, Cabrera became the first player since 1967 to win the batting Triple Crown, leading the AL with a .330 batting average, 44 home runs, and 139 RBI, earning him the AL MVP award that year. In 2013 Cabrera improved on the previous year's batting performance, including a career-high .348 batting average, and received another AL MVP award. Cabrera is widely regarded to be one of the best pure hitters in baseball, and one of the greatest players of his era, combining great power with a high batting average and good walk rate, along with a low strikeout percentage. He has hit 30 or more home runs during ten separate seasons, driven in over 100 runs in eleven consecutive seasons (2004–2014), and has a career .321 batting average – currently the highest among active players with at least five years of major league service. Cabrera has been praised for hitting many line drives and fly balls whilst maintaining a low pop-up rate, hitting the ball to all fields, and for his notable ability to drive inside pitches for home runs. Cabrera was born on April 18, 1983, in Maracay, Aragua State, Venezuela, to parents Miguel and Gregoria (née Torres) Cabrera. Miguel was signed by the Marlins in 1999 as an amateur free agent and came up through their farm system, teaming with future major leaguers Adrian Gonzalez and Dontrelle Willis. He began his professional career in 2000 as a shortstop in the Gulf Coast League (GCL). After batting .260 with 10 doubles, two triples and two home runs through 57 games for the GCL Marlins, Cabrera was promoted to Class-A ball where he finished the final eight games batting .250 with 6 RBIs for the New York–Penn League (NYPL) Blue Sox in Utica, New York. Heading into 2001, the Marlins bumped Cabrera up to the Low Class-A Kane County Cougars where he teamed up with current Los Angeles Dodgers first baseman Adrian Gonzalez. He earned his way into the Futures Game during All-Star Weekend in Seattle, along with Gonzalez. He ended the year batting .268 with 30 extra-base hits, 66 RBIs, and distinguished himself as having the strongest arm in the Midwest League. Entering the following season, Cabrera was once again promoted, this time to the Jupiter Hammerheads of the High Class-A Florida State League. At the request of then Marlins coach, Ozzie Guillén, Cabrera made the transition from shortstop to third base. By July, his average was locked in at .277, and he led his team with 45 RBI earning himself a second trip to the Future's game, where he collected two singles. He finished the season batting .278 with 43 doubles and 75 RBIs. Up to this point, he hit just nine homers in his 489 at-bats. To begin the 2003 season, Cabrera earned another promotion to the Double-A Carolina Mudcats. There he teamed up with Dontrelle Willis, the left-handed fireballer with whom he would later join in the majors. In his fourth professional season, Miguel was shredding the competition. In April, he hit .402, and by June his average stood at .365 with 10 homers and 59 RBIs before being called up to the majors. Cabrera made his major league debut on June 20, 2003, at 20 years old; Édgar Rentería, at 19 years old, was the only Marlins player to make his debut at a younger age. Cabrera hit a walk-off home run in his first major league game, following Billy Parker in 1972 and Josh Bard in 2002 as the third player since 1900 to hit a game-winning home run in his big-league debut. Cabrera became the Marlins cleanup batter. Cabrera's postseason play helped propel Florida to a World Series championship over the New York Yankees and also landed him on the cover of ESPN The Magazine during the offseason. In the NLDS against the Giants, Cabrera hit .286 with three RBIs. After changing positions in the heat of the NLCS against the Chicago Cubs, he hit .333 with three homers and six RBIs. In game 4 of the 2003 World Series against the Yankees, Cabrera faced Roger Clemens for the first time in his career. In the first inning, Clemens threw a 92-mph fastball in the vicinity of Cabrera's chin causing Cabrera to turn and stare at Clemens. Later in the at bat, Cabrera hit a pitch to deep right field for a two-run home run. The home run would give the Marlins an early 2–0 lead en route to a 4–3 Marlins victory that evened the series at two games apiece. Cabrera and the Marlins would go on to win the 2003 World Series in 6 games. In his first season Cabrera batted .268 (84-for-314), with 12 home runs, 62 RBIs, 39 runs, 21 doubles, and three triples in 87 games played and received NL Rookie of the Month honors for both July and September. In 2004, he batted .294 with 33 home runs, 112 RBIs, 101 runs, 177 hits, a .366 on-base percentage, a .512 slugging percentage from the third and fourth spots in the order, while playing in 160 games and earning his first All-Star appearance. Cabrera spent the entire 2004 season playing in the outfield and had 13 outfield assists. In 284 total fielding chances, he committed nine errors (tied for the most among NL outfielders) and made 262 putouts. In 2005 he was second in the National League in hits with 198, and batted .323 with 33 home runs, 43 doubles, two triples, and 116 RBIs. He was voted to his second consecutive All-Star Game along with teammates Paul Lo Duca and Dontrelle Willis, and won his first Silver Slugger Award. His 33 home runs made him the youngest player in Major League Baseball history with back-to-back 30 homer seasons, at 22 years, 143 days. Albert Pujols did it at 22 years, 223 days. Cabrera also became the first Marlin in history to hit at least 30 home runs and drive in at least 100 runs in back-to-back seasons. Prior to the 2006 season, Cabrera represented Venezuela in the inaugural World Baseball Classic. the Venezuelan team finished seventh in the tournament. With help from teammates Josh Willingham and Dan Uggla hitting behind and ahead of him respectively, Cabrera finished the year with a .339 batting average, 26 home runs and 114 RBIs. He was selected to his third consecutive All-Star Game and won his second Silver Slugger Award. On June 22, 2006, pitcher Todd Williams let the first pitch of an attempted intentional walk get too close to the plate and Cabrera reached out and singled it to right center field. The hit occurred during 10th inning, scoring the winning run to give the Marlins a 6–5 lead over the Baltimore Orioles. During a July 9, 7–6 road loss to the New York Mets, Cabrera became involved in an altercation with teammate Scott Olsen. With the Marlins trailing 2–0, Mets catcher Paul Lo Duca hit a hard grounder that glanced off Cabrera's glove and rolled into left field, allowing a run to score as Lo Duca raced to second with a double. As they came off the field, Olsen could be seen shouting something at Cabrera. A moment later, television cameras showed Cabrera in the crowded dugout reaching past teammates to poke his finger at Olsen as the pitcher walked past him. Olsen tried to jab back at Cabrera, who charged Olsen and tried to kick the pitcher before both players were quickly separated by teammates. Cabrera was voted to represent the National League All-Stars for the 3rd time in his career and made his first appearance in the Home Run Derby. Cabrera finished in third place with 15 home runs in the event. Cabrera battled the Pittsburgh Pirates shortstop Freddy Sanchez for the National League batting crown until the last day of the regular season. Marlins manager Joe Girardi decided to bat Cabrera leadoff for the final game of the season to give him more chances to get a hit for the crown. He ended up finishing second to Sanchez. Cabrera also finished the 2006 campaign with a .568 slugging percentage and a .430 on-base percentage. On February 17, 2007, Cabrera became the first player of the 2007 offseason to win his arbitration hearing, obtaining a one-year contract worth $7.4 million. Cabrera made his fourth consecutive All-Star game. He was initially scheduled to participate in the Home Run Derby during the All-Star weekend, but an injured left shoulder, suffered a few days before the All-Star break, forced him out of the derby and limited him in the All-Star game to a pinch hit at-bat against Dan Haren in which he struck out. On September 4, 2007, Cabrera recorded his 500th RBI as a major leaguer, making him the third-youngest player to accumulate 500 RBIs. Hall of Famers Mel Ott and Ted Williams were the only players to precede him in this feat. On September 15, 2007, in a game against the Colorado Rockies at Coors Field, Cabrera drove in at least 100 runs for the fourth consecutive year. His 100th RBI came in the first inning against Ubaldo Jiménez. Five innings later, Cabrera added four more RBIs when he hit a ball 438 feet (134 m) into the center field trees for his first career grand slam. He joined David Ortiz, Alex Rodriguez, Albert Pujols, Mark Teixeira, Bobby Abreu and Vladimir Guerrero as the only players to reach the 100-RBI plateau in each of the four previous seasons. In 2007, Cabrera won the NL Player of the Week twice (April 1–8 and June 4–10). He also passed former Marlins Gary Sheffield and Derrek Lee for second on the franchise home run list. He moved into third in all-time franchise RBIs and first in batting average. Cabrera ended the season with career highs in both home runs and runs batted in. On December 5, 2007, the Marlins traded Cabrera and starting pitcher Dontrelle Willis to the Detroit Tigers for pitchers Andrew Miller, Dallas Trahern, Eulogio De La Cruz and Burke Badenhop, outfielder Cameron Maybin, and catcher Mike Rabelo. On March 22, 2008, Cabrera reached an agreement with the Tigers on an eight-year, $152.3 million contract extension. At the time, the deal was the fourth-largest in baseball history, behind those signed by Alex Rodriguez, Derek Jeter, and Manny Ramirez. The deal was also the largest in Tigers history at the time, surpassing the five-year, $75 million contract signed by Magglio Ordóñez in 2005 (it was later surpassed in 2012 when Prince Fielder signed a 9-year, $214 million deal) Cabrera earned $11.3 million in 2008, and will receive an average of $20 million per year through 2015. 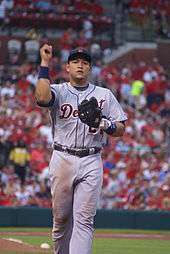 Cabrera made his Tigers debut on March 31, 2008, playing third base in a home game against the Kansas City Royals. In his third at-bat, he hit a solo home run off Royals pitcher Gil Meche. He finished the game 1-for-5 with two strikeouts, and the Tigers lost 5–4 in 11 innings. On April 22, manager Jim Leyland announced that Cabrera would be moving to first base, with Carlos Guillén becoming the starting third baseman. Cabrera had already made seven appearances at first, the first appearances at the position of his career. Cabrera was named the AL Player of the Month for July after batting .330 with eight home runs and 31 RBIs. On September 7, Cabrera reached the 1,000-hit plateau on a home run off Twins pitcher Glen Perkins. Cabrera finished the 2008 season with a career-high 37 home runs, which led the American League. He became the youngest AL home run champion since Troy Glaus in 2000. He also established a new career high in RBIs (127). He became one of only six players who have driven in at least 100 runs in each of the past five seasons, joining Alex Rodriguez, Albert Pujols, David Ortiz, Bobby Abreu and Mark Teixeira. 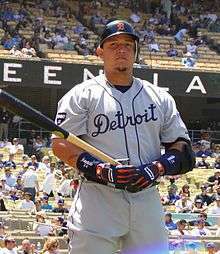 Cabrera was selected to play for Venezuela at the 2009 World Baseball Classic, along with Tigers teammates Magglio Ordóñez, Carlos Guillén, and Armando Galarraga. On Opening Day, Cabrera hit a grand slam in left-center that traveled more than 420 feet (130 m) at Comerica Park to give the Detroit Tigers a 15–2 victory over the Texas Rangers. Cabrera finished the game 4-for-6 with six RBIs. On August 23, 2009, Cabrera hit his 200th career home run in his 1,000th career game against the Oakland A's. He became only the fourth Venezuelan player to ever reach that plateau. Cabrera posted a .324 batting average, which was fourth in the AL. He also tied his career-high in hits with 198, which was also fourth among the AL. He also had yet another 100-plus RBI season making it the sixth straight year for him to reach the 100 RBI mark. On May 28 in a game against the Oakland Athletics in Detroit, Cabrera hit three home runs in a 5–4 Tigers loss. Two of the home runs were against starter Ben Sheets, and one against closer Andrew Bailey. It was the first three home run game in Cabrera's career, and came in his first game returning to the team after his daughter's birth. Cabrera was named an AL All-Star for the first time since joining the American League, and the fifth time in his eight-year career. He was chosen to be the starter in place of Minnesota Twins star Justin Morneau who was suffering a concussion. Cabrera also participated in the Home Run Derby, finishing fourth in the event with 12 home runs. On September 26 in a game against the Cleveland Indians Cabrera suffered a high ankle sprain while getting back to first base on a pick-off attempt. He initially tried to play, but the Tigers decided to shut him down for the remainder of the season. He ended his 2010 season with a .328 batting average, a career-high 38 home runs and 126 RBIs. The lack of a strong #5 hitter to follow Cabrera in the Tigers lineup also resulted in him drawing a career-high 89 walks, which included an AL-leading 32 intentional passes. On defense, he led all AL first basemen in errors, with 13. Cabrera was named to his second AL All-Star team as a reserve, his sixth All-Star Game appearance overall. On July 15, 2011, the first game after the All-Star break, Cabrera collected his 1500th career hit, in a game against the Chicago White Sox. Cabrera hit for a .344 average, winning the AL batting title, while also leading the AL in on-base percentage (.448) and doubles (48). He had his eighth straight 100-RBI season (105) and fifth straight 30-HR season (30). He also reached a career-high in walks with 108. On defense, Cabrera led all AL first basemen in errors, with 13. Cabrera hit .429 with six home runs and 21 RBIs in September 2011, propelling the Tigers into the playoffs and eventually the American League Championship Series. In the first five games of the ALCS, Cabrera had a .565 OBP, as well as a home run and four doubles, one of them off the third base bag. Through 2011, he had the sixth-best career batting average of all active players (.317), and seventh-best slugging percentage (.555) and OPS (.950). In 2012, after the signing of first baseman Prince Fielder, the Tigers announced Cabrera would move back to third base. In a pre-season game with the Philadelphia Phillies and Hunter Pence batting, Cabrera was struck by a ground ball below the right eye, which broke a bone. Despite this, after seeing the team's orbital surgeon, Dr. Srinivas Iyengar, Cabrera believed he would be ready for opening day on April 5. He was, and was in the starting lineup on Opening Day. On April 7, he and new teammate Prince Fielder each hit two home runs against the Red Sox, including back-to-back ones in the fifth inning. That week, from April 4–8, Cabrera was named AL Player of the Week, his ninth time achieving that honor, five of them being with Detroit. Cabrera hit 5–11 in three games over that span with three home runs and eight RBI. On April 27, Cabrera collected his 1,000th RBI in a game against the Yankees. He is one of the few players in league history to reach this plateau before their 30th birthday, joining Hank Aaron, Albert Pujols and Lou Gehrig. Cabrera was named to the American League All-Star team as a reserve, as Rangers third baseman Adrián Beltré was voted as a starter. This marked Cabrera's third consecutive All-Star appearance as a member of the Tigers, and seventh appearance overall. On July 22, he hit his 300th career home run off White Sox starter Philip Humber. This made Miguel just the second Venezuelan-born player to reach this milestone, joining Andrés Galarraga who hit 399. On August 15, Cabrera became the first player in Detroit Tigers history to hit 30 home runs in five consecutive seasons, passing Hank Greenberg (1937–40) and Cecil Fielder (1990–93), who each had four consecutive 30 home run seasons. This also marked the eighth time in the last nine seasons overall that Cabrera has reached the 30 home run mark. Cabrera was voted the American League Player of the Month for August after batting .357 with six doubles, eight home runs, 24 RBI, 19 runs scored and 12 walks in 26 games. This was the second time that Cabrera was named player of the month for the Tigers as he joined Alan Trammell as the only Tigers to win the award more than once. Cabrera won the Triple Crown, finishing the season with an AL-leading .330 batting average, plus 44 home runs and 139 RBIs which led all of Major League Baseball. He became the first batter to win a Triple Crown since Carl Yastrzemski in 1967. Cabrera became the first player to win it without a tie in any of the three categories since Frank Robinson in 1966. He is the first Latin American player and the first third baseman to win a Triple Crown. Cabrera also had his first career 200-hit season, having hit safely 205 times. He was named The Sporting News Player of the Year. On October 27, 2012 he was awarded the AL Hank Aaron Award. Cabrera also led the AL in slugging (.606), OPS (.999), total bases (377), and hitting into double plays (28). In Game 4 of the 2012 World Series, Cabrera hit his first World Series home run since his rookie year with the Marlins in 2003, putting Detroit on the board for the first time in 2 games. During the bottom of the 10th inning, Cabrera was the final out of the World Series as he struck out looking, completing the San Francisco Giants' sweep of the Tigers. On November 15, Cabrera was named the AL's Most Valuable Player over Mike Trout of the Los Angeles Angels, receiving 22 out of 28 first place votes and 362 points from a panel of Baseball Writers' Association of America. Baseball Hall of Famer Al Kaline was quoted in 2013 as saying that Cabrera's performance was "unbelievable", and that Cabrera was already qualified for Cooperstown himself." Bob Nightengale of USA Today Sports called Cabrera "the greatest player in the game of baseball." Barry Bonds agreed with Nightengale's analysis, adding ""He's the best. By far. Without a doubt. The absolute best.'" Cabrera continued a torrid pace into the 2013 season, being named American League Player of the Month for May. Cabrera batted .379 (44-for-116) with nine doubles, 12 home runs, 33 RBIs, 23 runs scored and 15 walks in 28 games to claim his third career Player of the Month Award. Cabrera previously won top player honors in July 2008 and August 2012. The week of August 5–11, Cabrera was named the American League Co-Player of the Week, with fellow Tigers teammate Austin Jackson. Cabrera batted .429 (12-for-28) with two doubles, four home runs, 11 RBIs and seven runs scored over seven games, to win his 10th career player of the week award. As of the 2013 All-Star break, Miguel was hitting .365 with 30 home runs and a league-leading 95 RBIs, considerably better than his 2012 Triple Crown season at the same point. Cabrera became the first player in MLB history to have at least 30 home runs and 90 RBIs before the All-Star break. Cabrera was voted in as the starter at third base for the first time in the fan balloting for the 2013 Major League All-Star Game. Cabrera won the ESPY Award in 2013 for Best MLB Player. On July 9, 2013, he hit his 350th career home run, against the Chicago White Sox. On August 18, Cabrera hit his 40th home run of the season in a game against the Kansas City Royals, joining Babe Ruth and Jimmie Foxx as the only MLB players in history to have at least 40 home runs, 120 RBIs and a batting average of .350 or higher through 116 games. Cabrera also became the third Tigers player in history to hit 40 or more home runs in consecutive seasons, joining Hank Greenberg (1937–38) and Cecil Fielder (1990–91). Cabrera was named the American League Player of the Month for August. Cabrera batted .356 (36-for-101) with five doubles, 11 home runs, 31 RBIs, 17 runs scored and 13 walks in 27 games to claim his fourth career Player of the Month Award and his second of the 2013 season, after claiming the award in the month of June. Following the All-Star Break, Cabrera suffered injuries including a groin strain that limited his playing time later in the season. Cabrera finished the regular season with a .348 batting average, and won his third straight AL batting title. Cabrera became the first Tiger to win three consecutive batting titles since Ty Cobb (1917–1919), and the first American Leaguer to win at least three straight since Wade Boggs (1985–88). He also led the AL in on-base percentage (.442) and slugging percentage (.636), was second in the league in home runs (44), RBIs (137) and runs scored (103), and was third in walks (90). On October 24, Cabrera was honored with his second consecutive Sporting News MLB Player of the Year Award. He is only the fourth player in history to win this award in back-to-back seasons, joining Ted Williams (1941–42), Joe Morgan (1975–76) and Albert Pujols (2008–09). On November 14, Cabrera won his second consecutive American League MVP Award, receiving 23 out of 30 first place votes and 385 points. Cabrera became the first American League player to win back-to-back MVP awards since Frank Thomas of the Chicago White Sox (1993–1994). He is only the third Tiger player to win the MVP award more than once, joining Hank Greenberg (1935, 1940) and Hal Newhouser (1944–45). Cabrera during batting practice in 2014. With the departure of Prince Fielder via trade, the Tigers announced that Cabrera would return to first base for the 2014 season. On April 4, in a game against the Baltimore Orioles, Cabrera hit a two-run home run to notch his 2,000th career hit, becoming the ninth player to reach 2,000 hits before his 31st birthday and the seventh-youngest to reach the mark. On July 6, it was announced that Cabrera had won the fan voting to start at first base for the American League at the 2014 All-Star Game. This was his ninth All-Star selection overall, and second straight as a starter. In the first inning of the All-Star game, Cabrera hit a 2-run home run off National League starting pitcher Adam Wainwright. It was his first career All-Star game home run. Cabrera won the ESPY Award for Best MLB Player for a second year in a row in 2014. On September 7, Cabrera recorded his 100th RBI of the season, reaching the milestone for the 11th consecutive season. Cabrera is only the fifth player in major league history to accomplish this feat, joining Lou Gehrig (13 seasons), Jimmie Foxx (13 seasons), Alex Rodriguez (13 seasons) and Al Simmons (11 seasons). Cabrera was named the AL co-player of the week for the week of September 1–7. Cabrera batted .500 (15-for-30) with two doubles, five home runs, nine RBI and eight runs scored in seven games to win his 11th career player of the week award. He led the major league in hits, home runs, total bases (32), and slugging percentage (1.067), tied for first overall in runs scored, and tied for second in RBI. Cabrera was named the American League Player of the Month for September. Cabrera batted .379 (39-for-103) with 10 doubles, eight home runs, 18 RBI, 39 hits, and 19 runs scored in 26 games to claim his fifth career Player of the Month Award. Cabrera led the league with a .737 slugging percentage and a 1.118 OPS. Cabrera finished the regular season with a .313 batting average, 25 home runs, 109 RBI and a league-leading 52 doubles; he led both leagues with 11 sacrifice flies. Along with Matt Holliday in 2014, Cabrera attained at least 20 HR, 30 doubles, 75 RBI and 80 runs scored each for the ninth consecutive season, becoming just the fourth player in MLB history to do so. The others previously to have accomplished this were Stan Musial, Manny Ramirez, and Pujols, all with ten consecutive seasons. On October 23, Cabrera was announced as a finalist for the American League Gold Glove Award for first base. This marks the first time he was nominated for the accolade. The other two nominees for the award included Albert Pujols and the defending Gold Glove winner Eric Hosmer, with Hosmer eventually winning the award for 2014 as well. On October 24, Cabrera underwent surgery to remove a bone spur in his right ankle that had been bothering him for several months. He also had a procedure to repair a stress fracture in the navicular bone near the top of his right foot. Doctors knew about the bone spurs, but said the discovery of the broken bone was a surprise. Cabrera himself said he wasn't surprised, stating, "I was feeling a lot of pain. I knew something was wrong." He said he had to alter his swing mechanics the last half of the 2014 season, being unable to put weight on his back foot without pain. Cabrera was named the AL player of the week for the week of April 5–12. Cabrera batted .520 (13-for-25) with two doubles, two home runs, eight RBIs and four runs scored over six Tigers victories to win his 13th career player of the week award. He led the league in total bases (21), hits (13) and on-base percentage (.586), was tied for first in RBIs and was second in batting average and slugging percentage (.840). He finished the week by registering back-to-back four-hit games for the first time in his career. On May 16, 2015, Cabrera hit his 400th career home run against Tyler Lyons of the St. Louis Cardinals, making him the all-time leader in home runs among Venezuelan-born players, surpassing the previous record holder, Andrés Galarraga. At the age of 32 years, 28 days, he is the third-youngest active player to reach this milestone, behind Albert Pujols (30 years, 222 days) and Alex Rodriguez (29 years, 316 days), and the eighth-youngest in history. On May 21, Cabrera recorded his 1,400th career RBI. At the age of 32 years, 33 days, he is the fifth-youngest player to reach the milestone. On July 4, Cabrera was placed on the 15-day disabled list with a Grade 3 left calf strain, including tearing of muscle fibers. This marks the first time Cabrera has been placed on the DL in his 13-year career. At the time of the injury, Cabrera was leading the league in batting average (.350), on-base percentage (.456) and OPS (1.034). He had 16 doubles, 15 home runs and 54 RBIs through 77 games. On July 5, it was announced that Cabrera had won the fan voting to start at first base for the American League at the 2015 All-Star Game, however he was unable to play due to injury. This is the sixth consecutive season that Cabrera has been named an All-Star and the 10th time in his career. Cabrera was recalled from the disabled list on August 14. On August 16, he recorded his 1,426th career RBI to surpass Andrés Galarraga for the most RBIs by a Venezuelan-born player. Cabrera finished the 2015 season with a .338 average, 18 home runs, 28 doubles, and 76 RBI. Cabrera's streak of eleven consecutive seasons with at least 20 home runs and 100 RBIs was snapped. His .338 batting average led the major leagues, and earned him his fourth AL batting title in the last five years. He is just the seventh player in history to win four AL batting titles, following Ty Cobb, Harry Heilmann, Wade Boggs, Rod Carew, Ted Williams and Nap Lajoie. He also led the American League with a .440 on-base percentage, and ranked second in the league with a .974 OPS. Cabrera won his sixth Silver Slugger award, and second at first base, becoming the 18th player to win at least six Silver Slugger Awards. Cabrera joins Alex Rodriguez as the only players with multiple Silver Slugger Awards at different infield positions. Cabrera was named the American League Co-Player of the Week, along with fellow Tigers teammate Cameron Maybin, for the week of May 16–22. Cabrera batted .500/.538/1.000 with three home runs and six RBIs during that time, to win his 14th career player of the week award. On May 23, Cabrera hit his 500th career double, becoming the 62nd player all time to reach the milestone. On June 12, Cabrera recorded his 2,400th career hit in his 2,000th career game, becoming the fifth-youngest player in MLB history to reach the milestone, at 33 years, 55 days old. On June 28, Cabrera hit a home run off his former team, the Miami Marlins, giving him the distinction of hitting a home run against all 30 Major League teams during his career. On July 5, Cabrera was named to his 11th All-Star team, as a reserve at first base for the American League. On July 22, Cabrera recorded his 1,500th career RBI, becoming the 56th player in major league history to reach the milestone. Cabrera reached 1,500 RBI with 400+ home runs faster than anyone in Major League history. He is one of six active players with at least 400 home runs and 1,500 RBI, and is more than two years younger than any of the other five. On August 18, Cabrera recorded his 1,000th RBI as a member of the Detroit Tigers. On September 5, Cabrera hit his 30th home run of the season and his 300th home run as a Detroit Tiger. He joins Al Kaline (399), Norm Cash (373) and Hank Greenberg (306) as the only four players to hit 300+ home runs in a Tiger uniform. On September 18, Cabrera recorded his 2,500th career hit off the Indians' Trevor Bauer, becoming the 100th player in Major League history to reach the milestone, and just the eighth player to do so by his age-33 season. He is the fourth-youngest (33 years, 181 days) to reach 2,500 hits, following Ty Cobb, Rogers Hornsby and Hank Aaron. Cabrera was named the American League Player of the Week for the week of September 26–October 2. Cabrera batted .565 (13-for-23) with six runs scored, a double, four home runs and 13 RBI over six games. Cabrera finished the period first in hits, RBI, batting average, slugging percentage (1.130) and on-base percentage (.583), second in home runs and total bases (26), and tied for third in runs scored in the American League. This marked Cabrera's 15th weekly honor, tying him with Barry Bonds for the second-most all-time. Cabrera was named the American League Player of the Month for the period of September 1 to October 2. Cabrera batted .347 (34-for-98) with 20 runs scored, four doubles, 10 home runs and 27 RBI over 26 games to claim his sixth career Player of the Month Award. Among American League leaders in September with a minimum of 80 at-bats, Cabrera finished the month second in slugging percentage (.694), tied for second in home runs and RBI, third in on-base percentage (.443), fourth in batting average, and tied for fourth in hits and runs scored. Cabrera finished the 2016 season with a .316 batting average, 38 home runs, 31 doubles, and 108 RBI. He finished tied for first in the AL (with David Ortiz) for the most intentional walks (15), and also led the AL by hitting into 26 double-plays. Cabrera won the 2016 AL Silver Slugger Award for first basemen, his seventh Silver Slugger Award overall and third award at first base. He is one of 13 Major League players to have won seven or more Silver Slugger awards since the award was introduced in 1980. Cabrera is very active in the community, and in 2012 he began The Miguel Cabrera Foundation to help a variety of children's funds. He also uses his foundation to encourage young kids to play baseball and softball. In 2012 and 2013, Cabrera was nominated by his team for the Roberto Clemente Award, honoring the MLB player who best represents baseball on and off the field. Cabrera is both a Catholic and a practitioner of Santería. He became a babalawo in the 2006 offseason. His wife is named Rosangel, and they have two daughters and one son, born August 2011. Cabrera and his family live in Birmingham, Michigan. In the early morning of October 3, 2009, police were called to the Cabreras' home and took Cabrera in for questioning. Cabrera had come home at 6:00am, after a night of drinking at the nearby Townsend Hotel, and got in an argument with his wife. He was seen later that day at a game at Comerica Park, with scratches on his face. Cabrera told reporters that the scratches came from his dog and refused to discuss the matter further. It was later reported he had a blood alcohol level of .26 when tested. On January 21, 2010, it was reported that Cabrera spent three months in an alcohol abuse treatment center to help him recover from his addiction. He said at the time he had not consumed any alcohol since he was taken into custody in October 2009, and that he would continue his treatment into spring training and the regular season. Cabrera was arrested in Florida on suspicion for drunken driving and resisting arrest on February 16, 2011. It was reported that the Tigers' 2012 post-division-clinching celebration held in the clubhouse in Kansas City was not attended by Cabrera, who desired to abstain from the festivities, even though the dousing "champagne" was non-alcoholic. 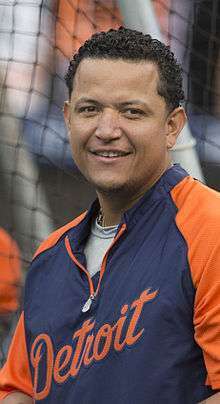 ↑ "Miggy secures first Triple Crown since 1967". MLB.com. MLB Advanced Media, LP. Retrieved 15 June 2016. 1 2 3 4 5 "Miguel Cabrera Statistics and History". baseball-reference.com. Retrieved October 9, 2011. ↑ "Miguel Cabrera Minor League Statistics & History". BaseballReference.com. Retrieved October 5, 2012. ↑ "New York Yankees vs. Florida Marlins – Recap – October 22, 2003". ESPN. October 22, 2003. ↑ "boxscore" at". Baseball-Reference.com. Retrieved March 14, 2014. ↑ "baseball-reference.com". baseball-reference.com. Retrieved March 14, 2014. ↑ "Yearly League Leaders & Records for Errors Committed as OF – Baseball-Reference.com". ↑ "Marlins' Cabrera spoils intentional walk in win". ESPN. June 22, 2006. Retrieved June 2, 2007. ↑ Tom D'Angelo (July 14, 2006). "Learning to Lead". Cox News. Retrieved March 22, 2007. ↑ "Cabrera's arbitration case settled". ESPN. February 17, 2007. Retrieved March 22, 2007. ↑ "Cabrera's 500th RBI for naught in loss". Retrieved September 4, 2007. ↑ "Cabrera's Cabrera powers Marlins over Rockies". Retrieved September 15, 2007. ↑ "Cabrera's grand slam propels Marlins to 10–2 win over slumping Rockies". Yahoo! Sports. September 16, 2007. Retrieved November 12, 2012. ↑ Passan, Jeff (December 4, 2007). "Cabrera, Willis dealt to Tigers". Yahoo! Sports. Retrieved December 14, 2007. ↑ "Tigers lock up Cabrera for eight years Contract is biggest awarded in Detroit team history". Retrieved May 23, 2008. ↑ "ESPN – Tigers move Cabrera to first base, Guillen to third – MLB". Sports.espn.go.com. April 23, 2008. Retrieved October 9, 2011. ↑ "Miguel Cabrera gets A.L. Player of the Month honors". Bleacher Report. Retrieved 2015-12-25. ↑ "Tigers hit 3 home runs, beat Twins 7–5 – MLB – Yahoo! Sports". Yahoo! Sports. September 7, 2008. Retrieved October 9, 2011. ↑ "Yearly League Leaders &amp Records for Home Runs". Baseball-Reference.com. Retrieved October 9, 2011. ↑ Kornacki, Steve (September 29, 2008). "Home run champ Cabrera is Tigers' top star". MLive. Retrieved October 9, 2011. 1 2 "Yearly League Leaders & Records for Errors Committed as 1B – Baseball-Reference.com". ↑ Iott, Chris (July 15, 2011). "Tigers' Justin Verlander allows five runs, Detroit falls to White Sox to open second half". MLive. Retrieved July 15, 2011. ↑ "Miguel Cabrera Statistics and History". Baseball-Reference.com. Retrieved October 9, 2011. ↑ "Cabrera, Prince will anchor the corners for Tigers". Fox Sports Detroit. January 26, 2012. Retrieved January 26, 2012. ↑ "Cabrera avoids DL after being hit in eye". CNN. March 20, 2012. ↑ Beck, Jason (April 7, 2012). "Miggy, Prince tee off in Tigers' rout of Red Sox". MLB.com. ↑ Iott, Chris. "Detroit Tigers' Miguel Cabrera named American League Player of the Week". MLive. Retrieved April 14, 2012. ↑ Snyder, Matt. "All-Star rosters at". CBS Sports. Retrieved March 14, 2014. ↑ "Tigers sweep ChiSox; Miggy belts 300th". CBS Sports. July 22, 2012. ↑ "Miguel Cabrera makes more Tigers history with 30th home run vs. Twins.". Detroit Free Press. August 15, 2012. ↑ "Miguel Cabrera of the Detroit Tigers named the Budweiser Presents American League Player of the Month for August". MLB. September 4, 2012. ↑ "Miguel Cabrera becomes 1st Triple Crown winner in 45 years; Buster Posey wins NL batting title". The Washington Post. October 4, 2012. Retrieved October 4, 2012. ↑ "Miguel Cabrera Stats, Video Highlights, Photos, Bio". The Washington Post. October 4, 2012. Retrieved October 4, 2012. ↑ DiComo, Anthony (October 27, 2012). "Miggy awarded Triple Crown trophy by MLB". MLB. Retrieved October 27, 2012. ↑ "Posey, Cabrera named 2012 MLB MVPs". Sportsnet. November 15, 2012. Retrieved November 15, 2012. ↑ Slagter, Josh (February 18, 2013). "Al Kaline: Detroit Tigers' Miguel Cabrera 'a Hall of Fame player already' at age 29". MLive. Retrieved March 14, 2014. ↑ Nightengale, Bob (May 20, 2013). "Bonds on Cabrera: 'He's the best,' but". USA Today. Retrieved March 14, 2014. ↑ 6/3/2013 3:20 P.M. ET. "Miguel Cabrera of the Detroit Tigers named the Budweiser presents American League Player of the Month for May | MLB.com: News". MLB. Retrieved March 14, 2014. ↑ "Miguel Cabrera and Austin Jackson of the Detroit Tigers named the American League Co-Players of the Week". MLB. Retrieved August 12, 2013. ↑ "Miguel Cabrera Stats, Video Highlights, Photos, Bio | tigers.com: Team". MLB. May 24, 2013. Retrieved March 14, 2014. ↑ "2013 All-Star Game rosters". MLB. July 14, 2013. Retrieved July 14, 2013. ↑ Keeney, Tim (July 18, 2013). "ESPY Awards 2013 Winners: Results, Recap and Top Moments". Bleacher Report. Retrieved July 18, 2013. ↑ "Cabrera belts 40th, Scherzer wins No. 18 as Tigers roll". CBS Sports. August 18, 2013. Retrieved August 18, 2013. ↑ "Budweiser presents American League Player of the Month for August". MLB. September 4, 2013. Retrieved September 4, 2013. ↑ Beck, Jason (September 29, 2013). "Miggy claims third straight AL batting title". MLB. Retrieved September 29, 2013. ↑ "Miguel Cabrera Statistics and History". Baseball-Reference.com. Retrieved March 14, 2014. ↑ Beaton, Al (October 24, 2013). "Miguel Cabrera named Sporting News 2013 MLB Player of the Year". blessyouboys.com. Retrieved October 24, 2013. ↑ Beck, Jason (November 14, 2013). "MiggyVP! Tigers slugger goes back to back". MLB. Retrieved November 14, 2013. ↑ Axisa, Mike (November 14, 2013). "Tigers' Miguel Cabrera named 2013 AL Most Valuable Player". CBS Sports. Retrieved November 14, 2013. ↑ Beck, Jason (November 21, 2013). "Kinsler joins Tigers as Fielder dealt to Texas". MLB. Retrieved November 21, 2013. ↑ "Marlins slugger Giancarlo Stanton agrees to richest contract in sports history". ↑ Heyman, Jon (March 28, 2014). "Miguel Cabrera's deal done: Tigers sign off on $292M commitment". CBS Sports. Retrieved March 28, 2014. ↑ "Miguel Cabrera contract is the worst". ↑ Mann, Jake. "Is Miguel Cabrera's New Contract the Worst in Baseball? -- The Motley Fool". ↑ Sipple, George (April 4, 2014). "Miguel Cabrera gets 2,000th hit in Tigers win". USA Today. Retrieved April 4, 2014. ↑ Hagen, Paul (July 6, 2014). "All-Stars unveiled, including 25 first-timers". MLB. Retrieved July 8, 2014. ↑ Beck, Jason (July 15, 2014). "Cabrera launches first All-Star Game homer". MLB. Retrieved July 15, 2014. ↑ Crawford, Kirkland (July 17, 2014). "Detroit Tigers' Miguel Cabrera, Floyd Mayweather win ESPYs". Detroit Free Press. Retrieved July 17, 2014. ↑ Khan, Ansar (September 8, 2014). "Tigers manager Brad Ausmus: No decision yet on whether Miguel Cabrera needs off-season surgery". MLive. Retrieved September 8, 2014. ↑ "Miguel Cabrera and Nelson Cruz named the American League Co-Players of the Week". MLB. September 8, 2014. Retrieved September 8, 2014. ↑ Beck, Jason (September 30, 2014). "Player of Month Miggy got hot at perfect time". MLB. Retrieved September 30, 2014. ↑ Schmehl, James (September 30, 2014). "Detroit Tigers' Miguel Cabrera named American League player of month for fourth time in career". MLive. Retrieved September 30, 2014. ↑ Sipple, George (September 28, 2014). "V-Mart says Miguel Cabrera deserves MVP consideration". Detroit Free Press. Retrieved September 28, 2014. ↑ "Matt Holliday stats, video highlights, photos, bio (2014 highlights)". MLB.com. Retrieved March 30, 2015. ↑ Beck, Jason (October 23, 2014). "Kinsler, Avila, Miggy among Gold Glove finalists". MLB. Retrieved October 23, 2014. ↑ Beck, Jason (October 24, 2014). "Miggy's ankle surgery reveals foot fracture". MLB. Retrieved October 24, 2014. ↑ McCosky, Chris (February 24, 2015). "Trimmer Cabrera works toward being '100 percent'". The Detroit News. Retrieved February 24, 2015. ↑ Nowak, Joey (April 13, 2015). "Sizzling start nets Miggy AL Player of the Week nod". MLB. Retrieved April 13, 2015. ↑ Harris, Joe (May 16, 2015). "Miggy passes Big Cat with 400th homer". MLB.com. Retrieved May 16, 2015. ↑ "Kolten Wong, Lance Lynn lead Cardinals past Tigers to avoid sweep". ESPN. Associated Press. 18 May 2015. Retrieved 18 May 2015. ↑ Beck, Jason (May 21, 2015). "Miggy fifth-youngest to reach 1,400 RBIs". MLB. Retrieved May 21, 2015. ↑ Beck, Jason (July 4, 2015). "Miggy on DL with calf strain, to miss 6 weeks". MLB. Retrieved July 4, 2015. ↑ Miller, Doug (July 5, 2015). "AL, NL starters unveiled; rosters Monday". MLB. Retrieved July 5, 2015. ↑ Beck, Jason (August 16, 2015). "Miggy homers for Venezuelan RBI record". MLB. Retrieved August 16, 2015. ↑ Beck, Jason (October 4, 2015). "With season's end, Miggy wins batting title". MLB. Retrieved October 4, 2015. ↑ Beck, Jason (November 12, 2015). "Miggy, J.D. Martinez claim Silver Sluggers". MLB. Retrieved November 12, 2015. ↑ Kruth, Cash (May 23, 2016). "Miggy, Maybin named AL Players of Week". MLB. Retrieved May 23, 2016. ↑ "Miguel Cabrera hits 500th career double". John's Big League Baseball Blog. May 23, 2016. Retrieved May 24, 2016. ↑ Needelman, Joshua (June 12, 2016). "Miggy 5th-youngest to reach 2,400 career hits". MLB.com. Retrieved June 12, 2016. ↑ Trister, Noah (June 28, 2016). "Tigers homer 3 times in 7-run 5th, beat Marlins 7-5". CBSsports.com. Retrieved June 29, 2016. ↑ Fenech, Anthony (July 6, 2016). "Tigers' Miguel Cabrera happy to be All-Star, stumps for Ian Kinsler". Detroit Free Press. Retrieved July 7, 2016. ↑ McCosky, Chris (July 22, 2016). "Tigers' Cabrera drives in 1,500th run". The Detroit News. Retrieved July 22, 2016. ↑ Robinson, Sam (July 22, 2016). "Cabrera fastest in history to 400 home runs, 1,500 RBIs". Today's Knuckleball. Retrieved July 26, 2016. ↑ Trister, Noah (August 18, 2016). "Tigers edge Red Sox 4-3, snapping Boston's 6-game win streak". CBSsports.com. Retrieved August 19, 2016. ↑ Cranston, Mike (September 5, 2016). "Cabrera has 2 HRs, Upton homers in 11th to lift Tigers". CBSsports.com. Retrieved September 6, 2016. ↑ Beck, Jason (September 18, 2016). "Miggy among quickest to reach 2,500 career hits". MLB.com. Retrieved September 18, 2016. ↑ "Miguel Cabrera Named AL Player of the Week". MLB.com. October 3, 2016. Retrieved October 3, 2016. ↑ "Miguel Cabrera Named American League Player of the Month for September". MLB.com. October 3, 2016. Retrieved October 3, 2016. ↑ Fenech, Anthony (November 10, 2016). "Tigers' Miguel Cabrera wins 7th Silver Slugger Award". Detroit Free Press. Retrieved November 11, 2016. ↑ "2012 Roberto Clemente Award Nominees". MLB. Retrieved October 14, 2013. ↑ "Voting under way for Clemente Award". MLB. September 17, 2013. Retrieved October 14, 2013. ↑ Baxter, Kevin (26 June 2007). "Religion Under Wraps". Los Angeles Times. Retrieved 27 August 2014. ↑ Beck, Jason (May 26, 2010). "Tigers' Cabrera, wife welcome second child". MLB. Retrieved May 26, 2010. ↑ "Police: Cabrera, wife won't be charged". ESPN. October 6, 2009. Retrieved September 25, 2013. ↑ "Tigers' Cabrera treated, says life is good". Associated Press. January 22, 2010. Retrieved January 22, 2010. ↑ "Tigers' Miguel Cabrera arrested on suspicion of drunk driving I". Los Angeles Times. February 17, 2011. Archived from the original on February 21, 2011. ↑ Passan, Jeff (October 2, 2012). "Miguel Cabrera sits out raucous celebration, even with division title in hand and Triple Crown near". Yahoo! Sports. Retrieved March 14, 2014. Wikimedia Commons has media related to Miguel Cabrera.